With Vajra Jasmine County, the highly renowned Vajra Group of Developers have begun the inception of luxury living in the form of high-rise apartments, located in the heart of the Financial District, Hyderabad. 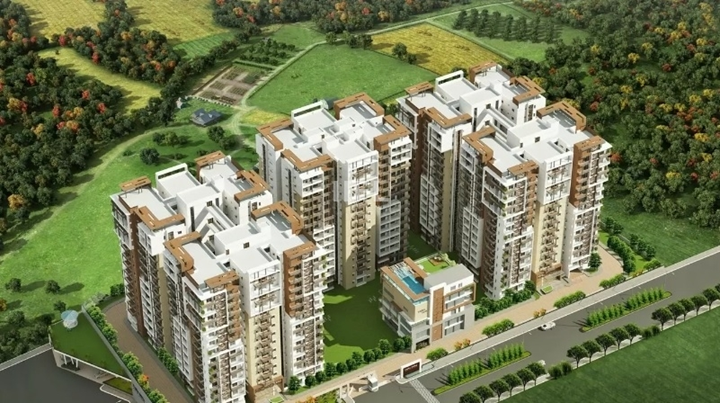 Spread over an area of 4 acres, with 5 towers that accommodate 14 floors each; this project promises to bring you spacious 3 BHK apartments, along with 2 levels of underground parking space. To add to the opulent residential surroundings, the project also consists of a club house that is fully equipped with modern-day amenities for the benefits and comfort of residents. Despite the proposed project being residential in nature, it included a complex network of services that needed careful detailing during the planning and groundwork stages. The project was handed over to Tata Projects – a segment of the illustrious Tata Group of Companies, for smooth and error-free execution. While the project is a straightforward residential one, it always has the potential to contribute heavily in the time taken for completion. Factors like: the height of the towers, and complexity of the HVAC (Heating, Ventilation and Air-Conditioning) mapping could cost the execution highly, if not well planned in advance. For a project of such caliber, it is important to have unparalleled coordination between multiple subcontractors, for a smooth and efficient workflow, to bring about a riveting outcome on-site. It was crucial to have the architects, subcontractors, contractors, design consultants and owners on the same page, in order to execute a majestic project flawlessly, while avoiding delays and additional construction costs. With their prominent reputation, Tata Projects was on the hunt for an experienced and innovative BIM (Building Information Modelling) firm who would help them resolve recurring on-site problems, and deliver a smooth sailing plan. Post inspecting the market for viable BIM service providers, Tata zeroed in on Arth DesignBuild for their BIM services. With a large pool of resources that ensure timely delivery of projects, and a young team of highly talented architects and engineers who are proficient in the process of BIM; Arth was on-boarded for the project and was ready to deliver cutting edge results. Arth delivered a 3D simulation model of Vajra Jasmine County to Tata Projects, which consisted of a detailed documentation of the MEPF (Mechanical, Electrical, Plumbing & Fire) layout. This model reported numerous clash detections, which led to the BIM team at Arth preparing and releasing regular clash reports for the site team. Soon, the client’s team was enabled enough by BIM to interpret the plans and clash reports in a way where they could avoid major overlaps. Tata Projects soon began leveraging the team of experts at Arth, by seeking for their inputs and suggestions for optimum results. Once clash detection between all the treads of services and architectural/structural layouts were identified, solutions were suggested to the client and the on-site team before they started the fabrication work. Arth incorporated 4D scheduling into the 3D model, which enabled the parameter of time to be linked to the ongoing project. The project managers were given a visual representation of the project schedules, which enabled them to track the progress of tasks in the form of monthly growth models. This in turn helped the managers to compare the actual progress of tasks versus the planned tasks, which enabled them to devise necessary adjustments to meet the projected forecast. This kind of crucial information enabled the site execution team to take informed on-site decisions. Arth was also responsible for building a 3D ‘as-built’ model for the client. This model covered the entire layout of the building as per the specifications and guidelines of the client. Though these critical requirements were virtually portrayed in the initial BIM file too; this model captured the project in such a detailed fashion, that every element within the built space was modeled as per the specifications and details provided by the client, along with any alterations done on-site during the process of construction. The BIM file was responsible for providing appropriate quantity take-offs for this project. Exact quantities for the structural elements, such as concrete (with grades as per design documents), were provided in time to avoid any wastage. BIM played a major role in helping the client save material and time, because manual measurements and calculations end up disappointing in the wastage department. This process enabled the procurement team of the client to attain required insights and solicit material accurately before proceeding with construction, which led to big savings in time and inventory costs. 4D scheduling in 3D BIM plans enabled precise planning, which in turn enabled our client to make informed decisions and stay on track with the timely completion of the tasks. Arth believes in leveraging the potential of BIM to bring about efficient and precise results. They are committed to providing suitable solutions to problems faced in the field of construction. With a well executed project like Vajra Jasmine County, Arth goes to show that they strongly believe in excellence, and in ensuring that any job undertaken by them is completed with precision.